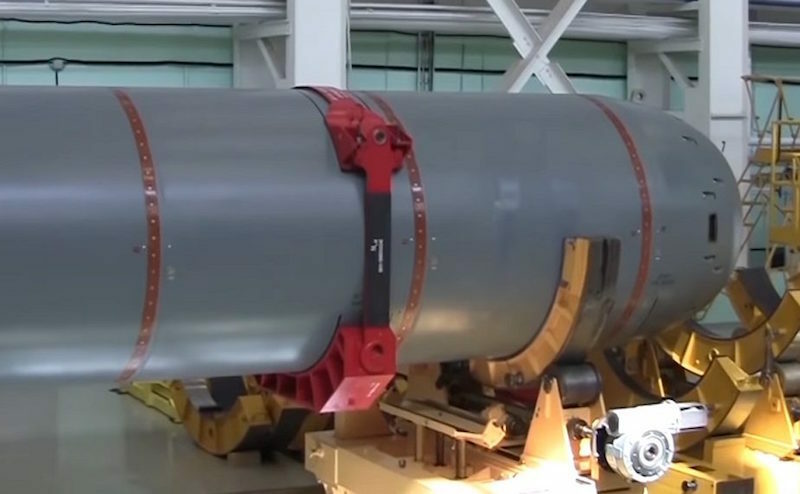 MOSCOW --- The Russian Navy plans to place more than 30 Poseidon strategic nuclear-capable underwater drones on combat duty, a source in the domestic defense industry told TASS on Saturday. "Two Poseidon-carrying submarines are expected to enter service with the Northern Fleet and the other two will join the Pacific Fleet. Each of the submarines will carry a maximum of eight drones and, therefore, the total number of Poseidons on combat duty may reach 32 vehicles," the source said. The special-purpose nuclear-powered submarine Khabarovsk currently being built at the Sevmash Shipyard will become one of the organic carriers of the Poseidon nuclear-capable underwater drone. Also, special-purpose submarines and Project 949A nuclear-powered underwater cruisers operational in the Russian Navy may be used as the carriers "after their appropriate upgrade," the source noted. Poseidon drones together with their carriers - nuclear-powered submarines - make part of the so-called oceanic multipurpose system. The drone got its name following the results of open voting on the website of Russia’s Defense Ministry. MOSCOW --- Russia has launched the underwater trials of the Poseidon nuclear-capable strategic drone whose development was unveiled by Russian President Vladimir Putin in his state-of-the-nation address to both houses of the Russian parliament, a source in the domestic defense industry told TASS on Tuesday. "In the sea area protected from a potential enemy’s reconnaissance means, the underwater trials of the nuclear propulsion unit of the Poseidon drone are underway," the source said. The reactor is installed in the hull of the operating drone but the tests are being held as part of experimental design work rather than full-fledged sea trials at this stage, the source added. The Russian Navy is using one of its nuclear-powered submarines as the drone’s carrier during the trials, the source said. According to the source, the works on the drone are included in the state armament program for 2018-2027. The Poseidon is due to be delivered to the Navy until the program’s expiry, the source added. In his state-of-the-nation address to both houses of Russia’s parliament on March 1, Russian President Putin mentioned for the first time the country’s efforts to develop a nuclear-powered unmanned underwater vehicle that can carry both conventional and nuclear warheads and is capable of destroying enemy infrastructural facilities, aircraft carrier groups and other targets.